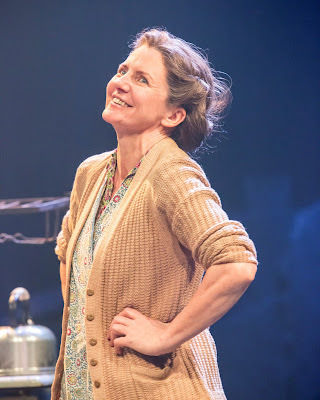 Flowers For Mrs Harris marks Daniel Evans’ farewell production at Sheffield’s Crucible and he bows out premiering a musical that is elegant, charming and beautifully crafted. Paul Gallico’s novel, set just after the Second World War tells of Ada Harris, a charlady widowed during the Great War and who, upon setting eyes on a Christian Dior dress in a client’s house, falls in love with the frock and sets about earning enough cash to buy one of her own. The strength of Gallico’s tale hangs upon Harris’ steely humble resolve in a world that has shown her few favours. Radiating an enchanted kindness to all those she encounters and inspired at first by the spirit of her dead husband with whom she shares private conversations, act one is about Ada raising the near-fortune of £500 to purchase the dress, with the second half centred around her antics upon reaching Dior’s salon in Paris. And at risk of spoiling, that's it for the plot - save to say that this hardened critic, who was expecting to be entertained if not necessarily moved by a show about a woman and a dress, was in tears at the denouement. Gallico’s work is a minute examination of post-war England. A time of rationed austerity, where class was prevalent and everyone knew their place. His world also demonstrates the timeless virtues of grace and kindness, demonstrating that whilst some people of power and wealth can behave like pigs, so too and on both sides of the Channel, can privileged folk act with love and compassion. At the centre of this journey is Clare Burt’s astonishing performance as Ada Harris. A glorious everywoman, Burt makes us believe in the utmost modesty of her lifestyle and its contrast with her dazzling Dior dream. We root for her endeavours and we (literally and audibly) gasp in anguish at her setbacks and stoicism. Imagine a female Jean Valjean, only this time from Battersea, and you start to get close to the genius that lies at the heart of Burt’s creation. Like Valjean’s encounters in Les Miserables, it is the individuals who Mrs Harris meets on her journey that make this tale. In assembling his cast Evans has plundered the A-List of Britain's musical theatre performers, with a neat conceit seeing all the cast (Burt excluded) double up from playing one role in Battersea to another in Paris – a touch that only makes the show’s charm sparkle more. There is much for Anna Jane Casey to do in London as Ada’s fellow widowed charlady, Violet Butterfield. Casey nails not only nails the female camaraderie of south London working class, but after the break returning as a fag hag of a Parisian femme de ménage, she is a hilarious delight. Rebecca Caine’s opera trained voice thrills, first as a wealthy Londoner and then as the manageress of the Dior salon who learns to overcome her own prejudiced snobbery. Laura Pitt-Pulford plays a well observed, petulant, wannabe movie actress in London, who cares little for her cleaner, Mrs Harris. But act two sees this gifted actress metamorphose into Natasha, Dior’s star model and in sporting the scarlet Rose ballgown, the highlight of the season’s collection on the Paris runway, Pitt-Pulford takes our breath away. There's a measured dignity to Mark Meadows’ supporting work, firstly as the ghost of Mr Harris and later on as a kindly French patrician, while Louis Maskell offers some beautifully sung romance as the young André, out to woo Natasha. Lez Brotherston’s set design suggests a bombed out Battersea, all power station and gasworks. But as the interval strikes his grim London is flown away to reveal a skyline of Paris highlights – only enhancing the magic of Mrs Harris’ arrival in the French capital. Brotherston's imagery is embellished with the imaginative use of a revolve - a further nod to Les Mis? The costumes are magnificent with act two’s fashion show proving a jaw-dropper. But badged as a musical – and to be fair Tom Brady’s 10piece band make fine work of the score – the tunes are hard to recall and frustratingly the show’s programme does not include a list of musical numbers. One’s memory can almost almost hint at having attended a play with songs. Either way, the show is pure class and let's hope that London producers will have travelled to Sheffield for make no mistake, the underlying production values of Flowers For Mrs Harris are exquisite. 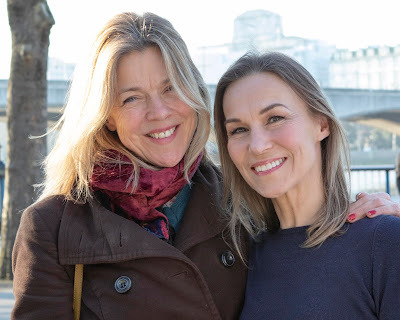 If the right West End venue were to be found then this new musical, Clare Burt, and her stellar company would surely deserve Olivier-nomination. Claire Burt should have been Mrs Henderson. Might have saved that show from early closure.